In 1966 a person wanting a full-size car had many choices of makes, and even after choosing a make, many choices of models. The 1966 Oldsmobile full-size line included 17 different models between the 88, 98, and Starfire lines. Even within the 88 line, there were three series with a selection of 11 different models. The Dynamic 88 was the intermediate model (not to be confused with intermediate size) between the lower Jetstar 88 and top line Delta 88. 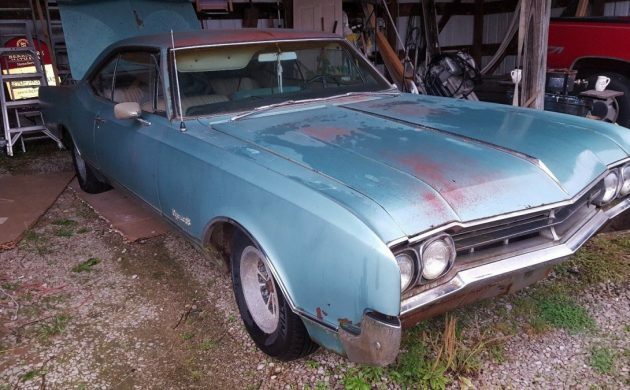 This 1966 Oldsmobile Dynamic 88 2 door Holiday Coupe is for sale here on eBay in Alvaton, Kentucky at a Buy it Now price of $2,500. 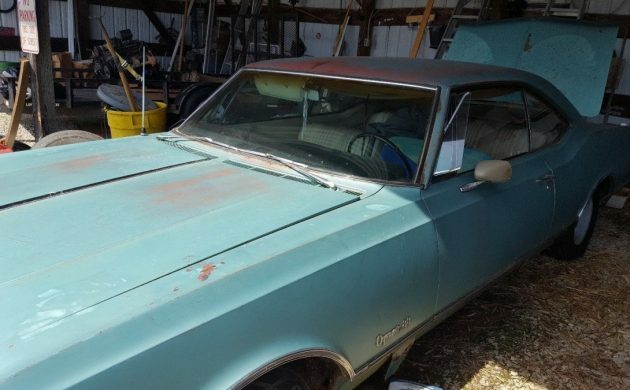 This blue shade was a popular color in the sixties and seventies, and a lot of times after just a few years, you would see the primer shining through just as you do on this Oldsmobile. The body looks in good condition except for both front rocker panel areas which seem to be showing some rust. All the trim is there and in good condition. Even though it shows the car in the barn, at some point it may have resided outdoors. The front seat cushion has some tears with the foam not looking too good underneath and we don’t know what the towel on the driver’s side may be hiding. The headliner is hanging down and will need attention. The dash looks pretty good but looks like there may be the start of a crack above the radio. This car appears to have factory air conditioning. There are no pictures of the engine. It comes with a 425 cubic inch Super Rocket V-8. It also has automatic transmission. Best of all it has had only one owner. The mileage is not known. 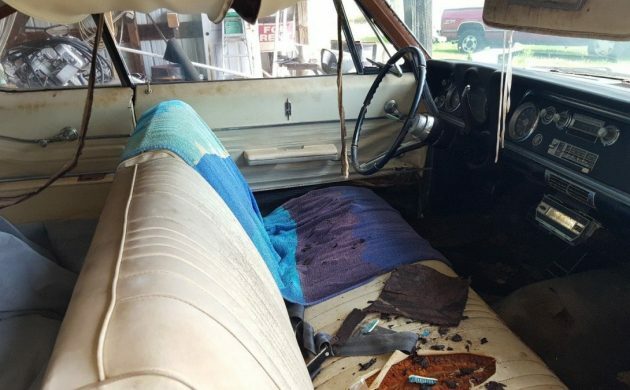 A lot of sellers like to see their cars continue in a restored to original condition, but this seller is fine with a Count’s Kustoms paint job or as a low rider dream car. 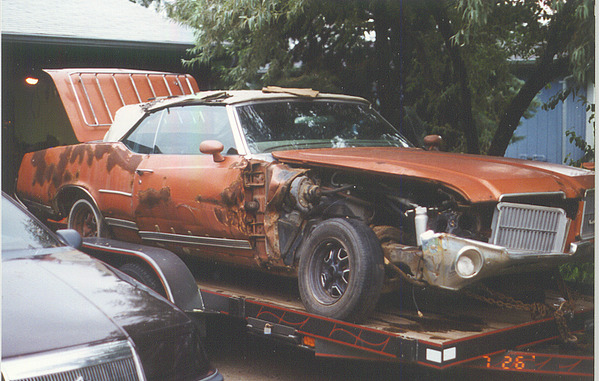 Would you choose to do something custom with it or restore it to original condition? Man, that’s no holiday. Well, it is a Holiday, it just wouldn’t be a holiday to fix it up. G. O. N. E. – sold. this could be fun. personally i was thinking if it went cheap enough i would not care what i did to it. 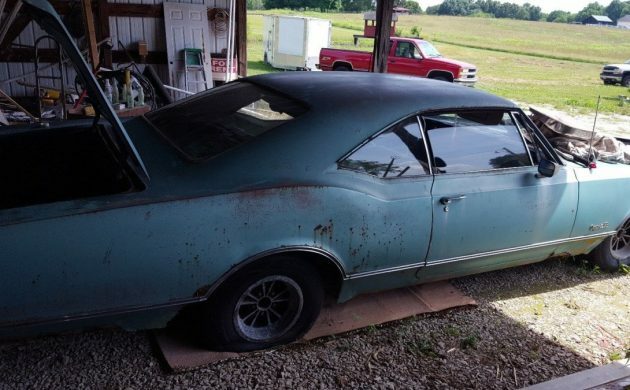 perhaps convert to 4 or 5 speed floor shifted clutch and perhaps an LS swap or just build the old Olds engine. I do like the lines of these and the blue and white interior would be set off nicely with black carpet. Another 10 years the car will be worth possible around 12,000 an investment to store as is …if you have the room ? that is a set of Foresight Ventures Drag Mags ! 15×6. Wonder what size these were ?? The rodders on the west coast snap these up quick. they used to bring half of what this car sold for.